Guarantee you're success in the US citizenship test in 2019! This 2 audio CD set has everything you need to pass your test with 12 lessons and 100 questions and answers. ¡Garantía que usted es éxito en la prueba de la ciudadanía de los E.E.U.U. en 2018! Este conjunto de 2 CD tiene todo lo necesario para pasar su prueba con 12 lecciones y 100 preguntas y respuestas. Disk 1: Comes with 100 study questions and answers for your interview in english in Spanish. This will make sure you know which questions may be asked and how to answer them. 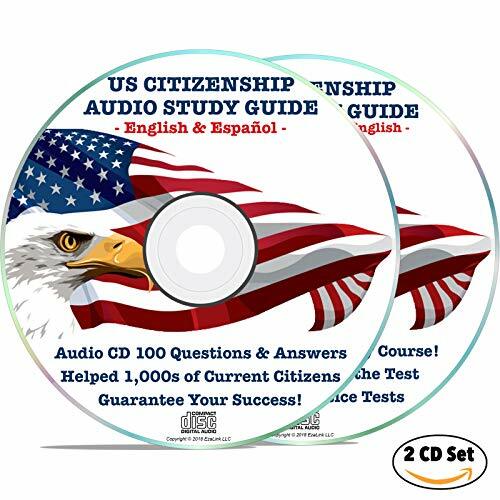 Disk 2: FULL USA citizenship audio course. 12 complete lessons on all the essential US topics you need to know to pass the test (see below for a complete list of lessons). It also has 2 practice exams! You can download print outs too. You can enjoy these on any CD player, computer, or even on your phone! There's no where you cannot take this audio! US Citizenship Test Study Guide 2019. CIUDADANIA AMERICANA 2019. 100 ILLUSTRATED U.S. CITIZENSHIP TEST CIVICS FLASH CARDS IN SPANISH & ENGLISH for the 2019 Naturalization Exam -with ONLINE AUDIO. -100 Official USCIS Questions and Answers. Ciudadania en Español.100 preguntas. US Citizenship test Civics Flash Cards for the Naturalization Exam 2019 | Includes Online Audios with all official 100 USCIS Questions and Answers | USCIS N-400. Get ready for the Immigration Test in only 20 days.